Whether we liked it or not, we were all gullible to the humorous PR stunts pulled by brands yesterday in an attempt to capitalize on the pranking bandwagon. With the rise in social media the extent to which brands can get PR coverage on a witty hoax is limitless, with the potential to go viral. We’ve picked our favorite pranks of the day that had the office talking at Guerilla HQ. McDonalds introduced “Shake Sauce” – the sweet new way to dip. McDonalds posted a photo to Instagram on Monday morning, showing the innovative new sauce flavours, including strawberry, vanilla, chocolate and shamrock – all of which corresponded with McDonalds milkhake flavours. The Australian McDonalds had a second prank in store for McDonalds lovers. The Australian McDonalds Facebook page introduced the juicy new ‘McPickle Burger’, consisting of “juicy, flavoursome pickles layered between melted cheese, ketchup sauce and toasted sesame seed buns.” However, McDonalds got themselves into a bit of a ‘pickle’ (pardon the pun) as the humorous PR stunt sent Australian pickle lovers into a wild frenzy. 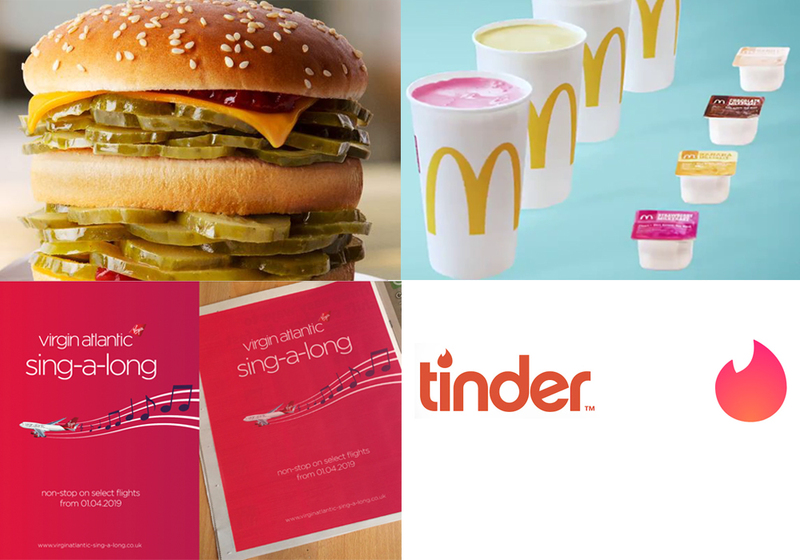 Virgin announced the trialling of sing-along flights on key routes from 1st April 2019. The extension of sing-along flights encouraged customers to join the crew in karaoke shortly after take-off. The musical flights include a Saturday Night Cabin Fever disco on weekend flights, mile-high hip-hop during flights to LA and non-stop Sinatra on flights to New York. Have you ever met someone from an online dating site and been surprised at their actual height in comparison to that stated on their dating profile? Tinder claimed to set the record straight on users height by introducing the ‘height verification feature’. This claimed to give honest users a ‘badge of honour’ after verifying their height by uploading a photo by a commercial building. The company wanted to raise awareness to the fact that only “14.5% of the US male population is over 6′ despite the many Tinder bios claiming otherwise,” Jenny Campbell, CMO of Tinder, said in an emailed statement to Fox News. Whilst this April fools prank caused uproar amongst users, Tinder encouraged users to remain truthful in their profile bios.